By and large, Texas Motor Speedway remains one of NASCAR’s most treacherous tracks on the season schedule. Of course, she may look like her sister tracks at Atlanta and Charlotte. However, as Matt Tifft described above, she is much different and Texas tough. Everything is bigger in Texas (as is the cold weather), so The Podium Finish’s columnists, Adam Lucas, Ashley Hobbs, Christina Bowman, Cody Shoppe, Jose Acero Jr, Kathleen Cassidy, Katie Coople, Kobe Lambeth, Matt Sisoler, and Stephen Conley share their thoughts on having a NASCAR documentary, Hendrick Motorsports’ struggles, and the 2020 Cup schedule! Recently, Netflix released a 10 episode documentary following various teams during the 2018 Formula One season. With the level of access provided and the candor displayed, would you want to see NASCAR have a series like this in the future? If so, which teams would be perfect for a documentary? Bowman : Honestly, I would have to see this documentary to accurately comment on this. 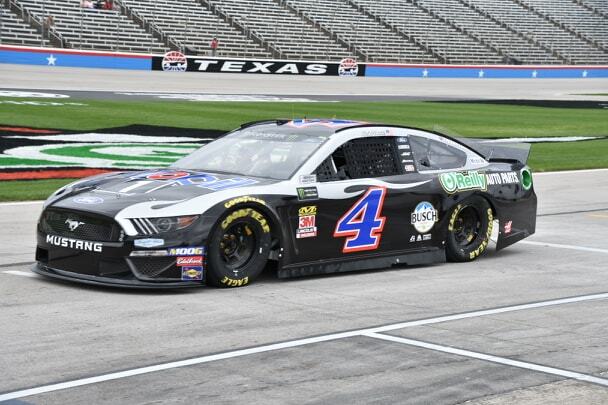 However, in general I think any fan of NASCAR would like to see this and I would like to see at least one team from each manufacturer and a small budget team be featured. This way there is variety to personality. Hobbs : NASCAR had a series like this, NASCAR Drivers 360 – and I loved that show! It was a great way to look into the lives of the drivers of the sport. However, that was on before the boom of social media. Now, these drivers basically bring us into their lives. I don’t think a TV show could do anything more than that. Honestly, NASCAR has a lot of programs on air between FOX and NBC that adding another, even if it is more fun, would oversaturate the market. However, if we replaced at least one of the existing news programs with something for fun that is driver based, I would be game for that. As to the drivers I would like to see on this documentary, I will go with: Kyle Busch, Brad Keselowski, Darrell Wallace Jr., Chase Elliott, Matt DiBenedetto, and Clint Bowyer. This gives us a mixture of veteran and younger drivers, champions and non-champions, fan favorites and villains, and old and young stars. Lucas : I’m having flashbacks to Kenny Wallace and Kevin Harvick’s shenanigans on NASCAR Drivers 360. If we could replicate that masterpiece from 2004, I know I would be all for it. If we were to have a docuseries, I would be interested in the personal lives of Ryan Blaney, Chase Elliott, Kevin Harvick, Kyle Busch, Matt DiBenedetto, and Austin Dillon. But for the love of all things sacred, let’s stay far away from a scripted series. Shoppe : I remember watching a show like this ABC did in 2007. I learned a lot about drivers like Johnny Sauter and have been huge fans of them ever since! I think if they did a show like this today it would be a good idea to show the struggles of small teams like Hulu did a couple years ago with Jeffrey Earnhardt. Help fans understand what goes into it all. Nascar drivers already share so much of their lives with us on social media, more so then Formula one. Still I would love to see this happen and anything to help get the personalities of the sport out there for people to discover is great for the sport! Despite Chase Elliott’s strong runner up at Martinsville, Hendrick Motorsports seems to be off this year. Is this a case of the team truly struggling or a team that’s just about ready to turn the corner soon? Acero : HMS is a team that knows how to get things done. Yeah they may be struggling at the moment but once they get everything sorted out, watch for them to have the strong presence on track of the high caliber organization that they are. I’m assuming it’s only a matter of time before we see Johnson, Byron and Bowman flip the switch and contend for wins. 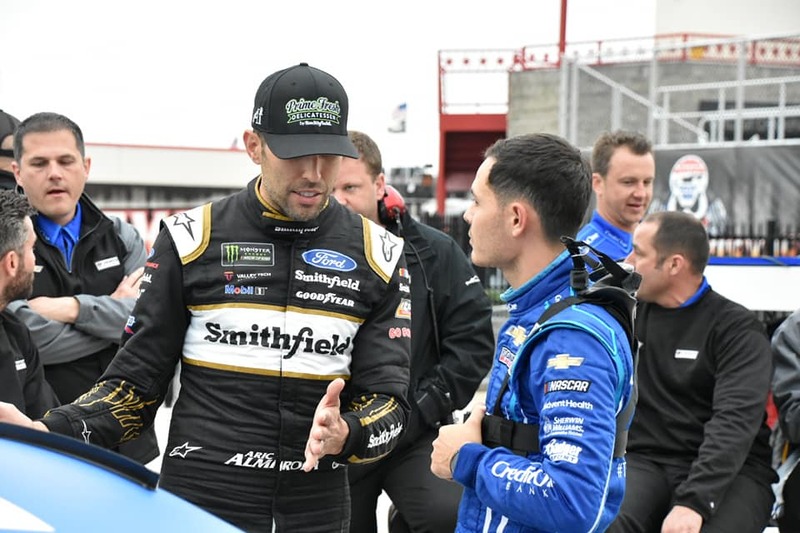 Cassidy : Hendrick Motorsports struggling this year is not a new phenomenon, as they seem to have picked up where they left off in the 2018 season. This team seems to have a few good cars here and there, but nothing consistent. I believe this is an organizational struggle that needs to be overcome, as other teams with Hendrick engines are finding success. Conley : Elliott’s run only highlights major problems at Hendrick Motorsports. When you look Johnson running in the low teens and 20’s at places where has dominated, like Martinsville, it shows there is an issue. Byron is running below where you’d expect a second year driver to be at. As for Bowman, it’s hard to tell what he’s got and the struggles with the team aren’t doing his career any good. You can’t tell if his inconsistencies are due to the team overall. Hendrick Motorsports is no longer the top dog in NASCAR and they are in real trouble if they have a repeat of last year or worse. It’s time to throw out the “trouble” call on HMS. 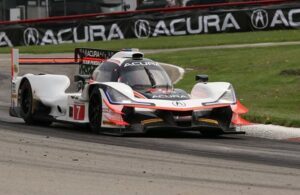 Copple : A breakthrough is coming soon for Hendrick Motorsprots! The team has been strong, they have just fallen short. They aren’t the powerhouse they used to be, but I think a lot of that is the fact that their average age in drivers dropped drastically in recent years. But Hendrick Motorsports is top dog for a reason. Don’t count any of them out. Lambeth : Hendrick Motorsports is no longer the “team to beat” on any given Sunday. For years, they have always had cars capable of winning most weekends. Times have changed. Jimmie Johnson is getting older and his three teammates are young drivers still gaining experience at the top level. I still think Chevrolet is struggling with the Camaro ZL1, in general. In my opinion, I believe that it is playing a factor in some of Hendrick’s struggles. However, it is still too early to be concerned. If we get to the summertime and the Hendrick cars are “out to lunch,” then the panic button is definitely being pushed. Sisoler : It is concerning that Hendrick seems to be slow out of the starting gates again. Chase has been the only consistent front-runner for HMS, and that is rather concerning to see a second straight year where 75% or more of the Hendrick quartet are struggling to match pace out of the gates. However, last year, Hendrick had three drivers in the Playoffs, and got stronger as the year went along, so it’s not quite time to panic for the Hendrick fans. However, if the season gets down to crunch time and Hendrick is still struggling, then it might be time to go to DEFCON 1. Tiongson : I am honestly concerned with Hendrick’s rather slow start. Sure, Chase Elliott has been their frontrunner and he’s flexed his muscles in that No. 9 car at the tracks where aero isn’t a totally major factor. That being said, I felt like we saw this slow start from Hendrick last year and they wound up having Elliott, Jimmie Johnson, and Alex Bowman make the Playoffs. With NASCAR announcing the 2020 schedule on Tuesday, March 26th, what are some of the biggest moments that jump out to you? Are you more excited about these changes, or still looking for more? Conley : Round number one of the Playoffs has me incredibly excited; Darlington, Richmond and Bristol! That is racing excitement overload. Now, even though I haven’t been the biggest proponent for night racing at Martinsville, this will be big for not only the track, but a big draw for the fans. Plus, how is the draw for Homestead going to be as “just another race” in its new position at race number 6? 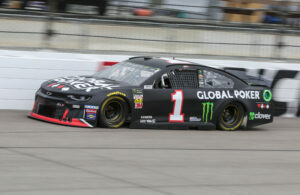 It’s a really significant change for the sport, and one that I believe is only the beginning of major changes that will send NASCAR in to the future. Hobbs : Wow – that is all I have to say. I was not expecting this much movement, and I am quite excited to see it! The Pocono double header is definitely huge! 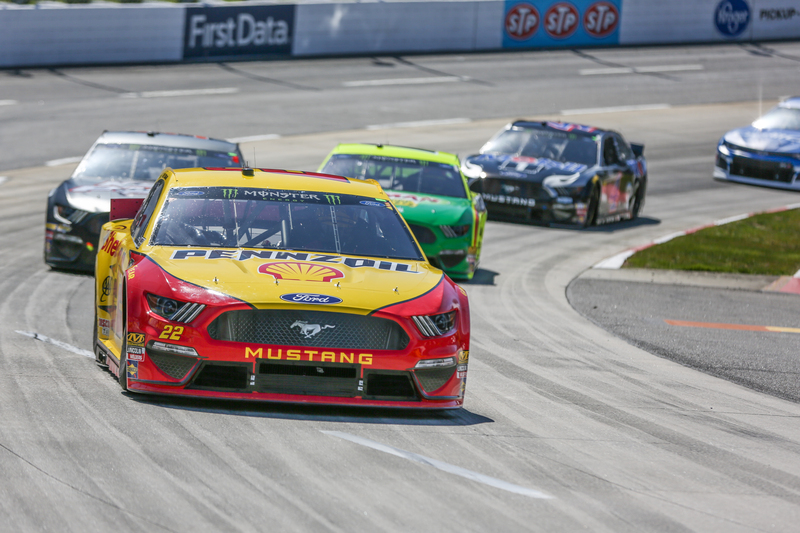 Pocono has always been one of the first tracks to try something different, and it is not crazy for them to be the first to try something this crazy. Little is known about that weekend, but it is exciting nonetheless! Also, I find Daytona International Speedway bookending the regular season intriguing! It adds a cool emphasis to the speedway. While it loses the iconic July 4th race, it will still remain iconic. Lastly, I want to give props to NASCAR and NBC on the off weekends for the Olympics. There is no point for NASCAR to compete with the Summer Olympics. So this is a very smart move for the sport. Yes, we don’t get racing for 2 weeks at the Cup level, but the Xfinity and Truck series will get their time in the sun. Plus, the Summer Olympics will certainly provide great action! Overall, I am very excited for these changes and am quite looking forward to 2020! Lambeth : I am quite pleased with the changes to the 2020 schedule. For starters, Atlanta got a much deserved date in mid-March. It should be more weather friendly for everyone at the track. Also, Martinsville earning a night race is very intriguing. I like the idea of a Pocono doubleheader weekend. It has proven to be a successful concept in the Australia Supercars. I am a bit confused by the decision to move Indianapolis to a scorching Fourth of July weekend. But, I am open to giving the new second Daytona race date a chance. However, I still have mixed feelings about ISM Raceway becoming the new championship race, replacing Homestead-Miami Speedway. Overall, I think this is the beginning of a new chapter for NASCAR, which will slowly happen over the next few years. Lucas : Martinsville under the lights on Mother’s Day weekend! 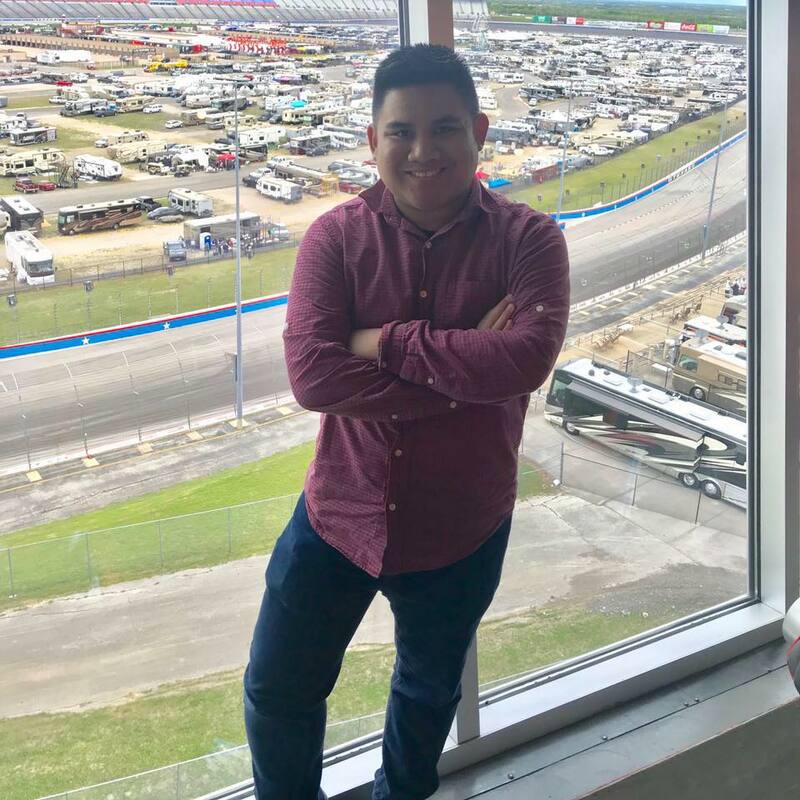 I am extremely excited for that race and hopefully the Pocono double header will be a successful attempt at a possible new type of race weekend to remedy the long season. I am disappointed with the Daytona/Indy flip. If Indianapolis wants to be a successful long term track for NASCAR, then it needs to run as a road course, rather than the oval. Daytona not on the 4th of July weekend is about as absurd as when we moved Darlington from Labor Day weekend. Remember the negative backlash? Yeah, I’m not sure we’ll see that level of anger from the fanbase, but it will have a different feel with Talladega only being a few weeks after the fall Daytona race. I like Phoenix as the finale with Martinsville taking over the “penultimate” slot. The sparks will be flying high that evening on November 1st! Shoppe : I was so disappointed to not see any old-school short tracks added to the schedule like Nashville which was talked about so much. As far as the changes that were made, I was so surprised to see Daytona losing the fourth of July weekend in favor of Indy. I don’t see any weekend helping the Brickyard event. 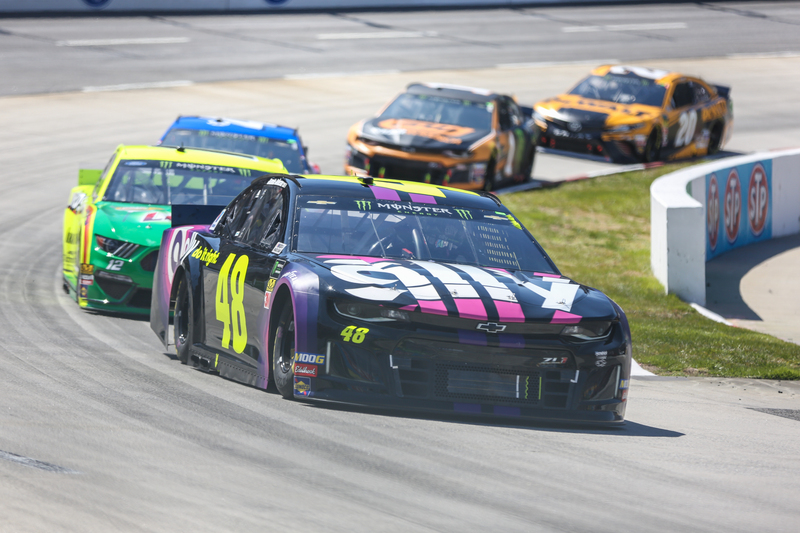 I see the move to the penultimate race of the year for Martinsville as a great move for NASCAR, maximizing the huge success that event has been with all the drama and excitement of a short track race to make it to the finale! As for the championship race moving to Phoenix, I am happy to see it change as a fan! I would like to see it rotate to many different venues like many have suggested. Sisoler : For the most part, I fell the changes to the 2020 schedule are great! To put Bristol and Darlington’s late races in the Playoffs is a really good move. And how about Martinsville getting a night race, and the penultimate Playoff race at that!? Chaos will reign there in 2020! Also, I really like the idea of a doubleheader weekend. To put it at arguably one of the toughest tracks on the schedule is excellent. Also, to flip the Indianapolis and Daytona dates is a solid move as well. Now as someone who grew up on the Firecracker/Pepsi/Coke/Coke Zero 400 being that weekend midway through the schedule, I liked that race at that point in the schedule. That said, I am excited to see how it goes. However, I do not feel that NASCAR got it fully correct, with the biggest sticking point for me being the location of the finale. I was not a big fan of Homestead having the finale. And now, I am not a big fan of putting ISM as the finale. I have always thought that the finale should be at a track that is a nationwide fan favorite and/or has some sentimental value to fans (Daytona, Talladega, Charlotte, Darlington, and Rockingham, if NASCAR brings it back). And, I don’t think ISM falls into that category. Also, I am not the biggest fan, to put it nicely, of how ISM looks after the changes that were made to the speedway. That being said, it’s NASCAR’s call, and we’ll have to see how it works before leaping to judgement. Tiongson : I really love the changes. I’m a bit cautious about ISM (Phoenix) having the season finale, but I love Round 1. 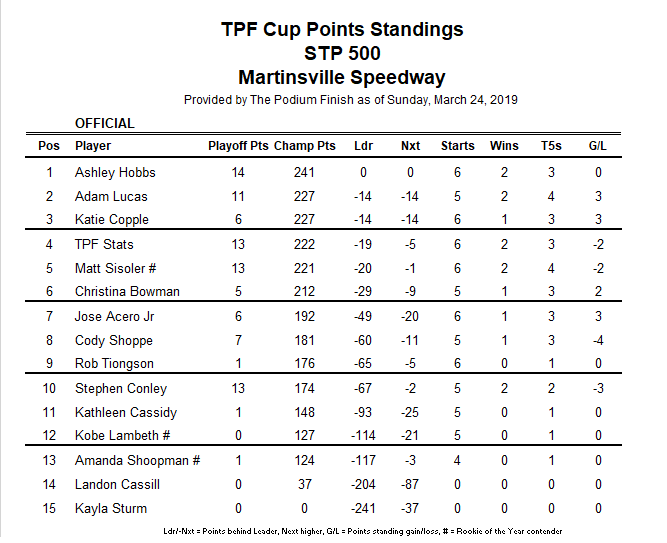 And how can you not love Martinsville being the penultimate race of 2020? I see drivers who are in desperation mode for one of the final Championship 4 spots putting courtesy on the side and using the old chrome horn. Daytona’s summertime race becoming the regular season finale may prove interesting. By that, we might see a surprise winner, who in turn, may go from having a not so great year to having a shot at the championship. I just think the West Coast Swing could’ve been extended by having Texas follow the ISM Raceway weekend in March. Get all of the West Coast races out of the way and then have a Southeast Swing. Either way, I’m excited for 2020 and I think NASCAR is showing some initiative into bringing entertainment with competition all year long. We’re about a corner away from reaching the stripe at Texas! With that in mind, let’s rewind things back to Martinsville and check out our race and points reports! 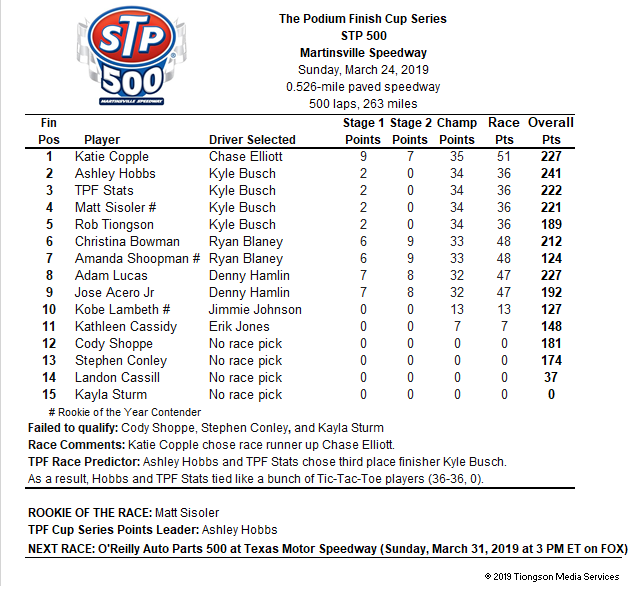 Copple parlayed points with Chase Elliott. Meanwhile, the points race heats up for a chilly race at Texas! We’ve dropped some opinions and thoughts in our preview. 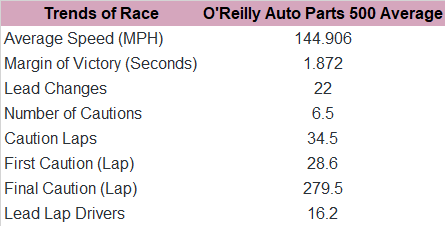 Now, let’s drop some knowledge with Ashley Hobbs’ Crunching the Numbers segment, O’Reilly Auto Parts 500 at Texas style! 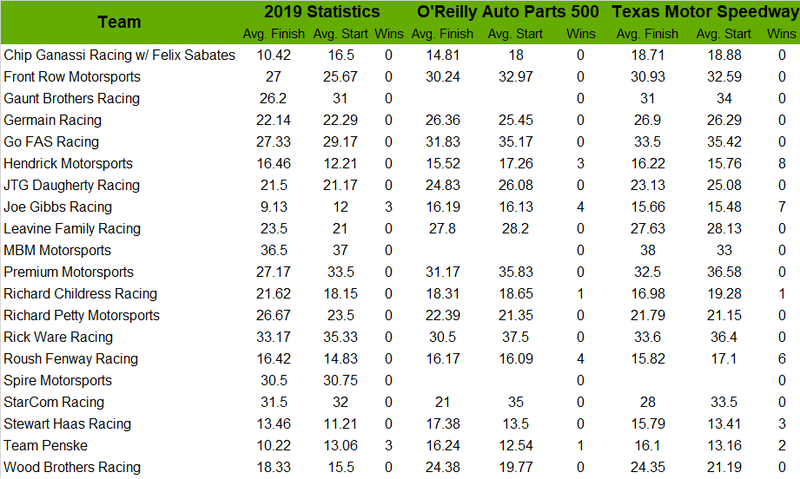 A look at team statistics at Texas’ spring race. Considering the averages of past Cup champs at Texas. Texas trends in the past five races. TPF Stats projects another weekend between two powerhouse Cup teams! Round seven may prove to be a competitive one in the Lone Star State. 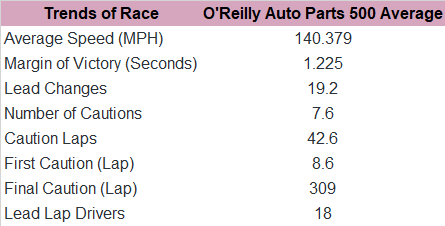 In that case, here’s our picks for today’s O’Reilly Auto Parts 500 at Texas! It’ll be a Texas throwdown between these five race picks! Tiongson : This race may prove to be the true test with this year’s aero and motor package. 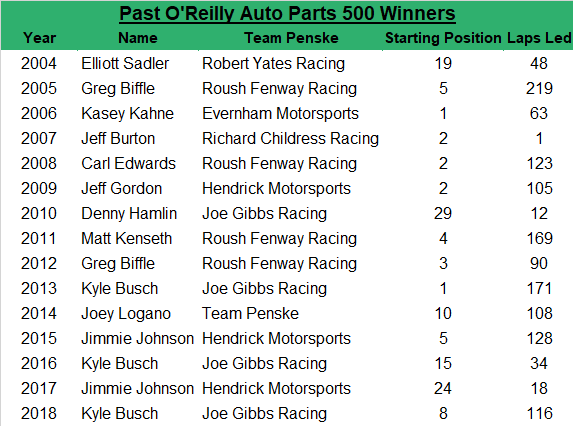 At some point, we will see someone outside of the Penske and Gibbs camp earn themselves a victory. However, I think Ryan Blaney continues this trend and will take the checkers on Sunday. Lambeth : Ryan Blaney will become the third and final driver from Team Penske’s Cup lineup to score a victory for the Captain this season. Shoppe : Coming off three straight top-fives and back to back top-fives at Texas, Ryan Blaney is on a roll that lead to victory this weekend! Acero : Time for Blaney to saddle up and win at Texas! Conley : Penske gets 3 in the playoffs as Blaney finally breaks through. Lucas : He’s always been a threat at Texas, even when driving for the Wood Brothers, Ryan Blaney gets the six shooters! Hobbs : I’m liking Chase Elliott this weekend. Yes, the Chevrolets have not had the best speed, but Texas Motor Speedway numbers for Elliott are hard to ignore. Sisoler : I think Chase Elliott plays to his strengths at Texas Motor Speedway and puts the No. 9 car No. 1 for the first time in 2019. Bowman : It’s really hard to go against Kevin Harvick at Texas. 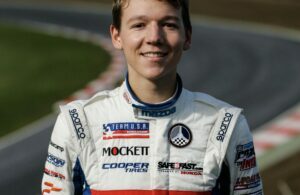 TPF Stats : In the six races of 2019, he has amassed two wins, five top-fives, 10 top-10’s, and has an average finish of a whopping 2.7. He also happens to be the defending race winner. Kyle Busch will continue his dominating ways this season. Race fans, thanks for joining us for our preview of the O’Reilly Auto Parts 500!